October is birthday month, and what better way to spend it than quality time with the family – at a museum of course! As birthday girl, I got to choose – I wanted somewhere new but close enough we could drive to with a screaming baby. 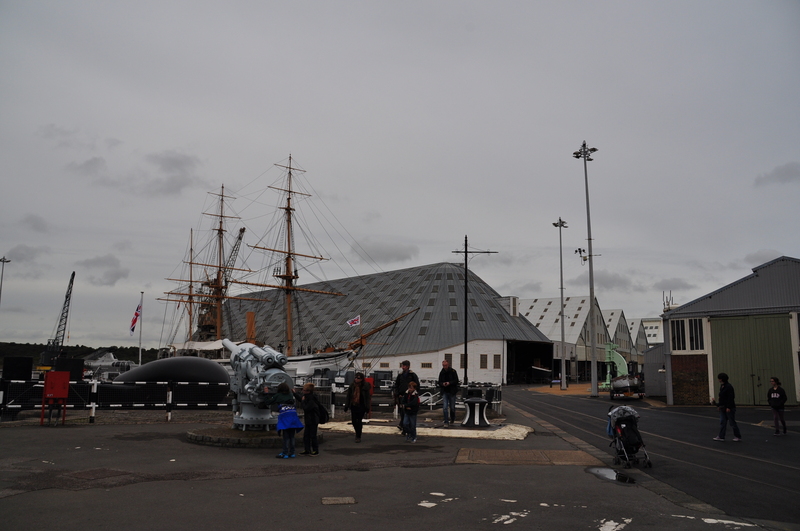 I plumped for the Historic Dockyard Chatham – less than an hour from home. There was no escaping – the whole family came on this trip. 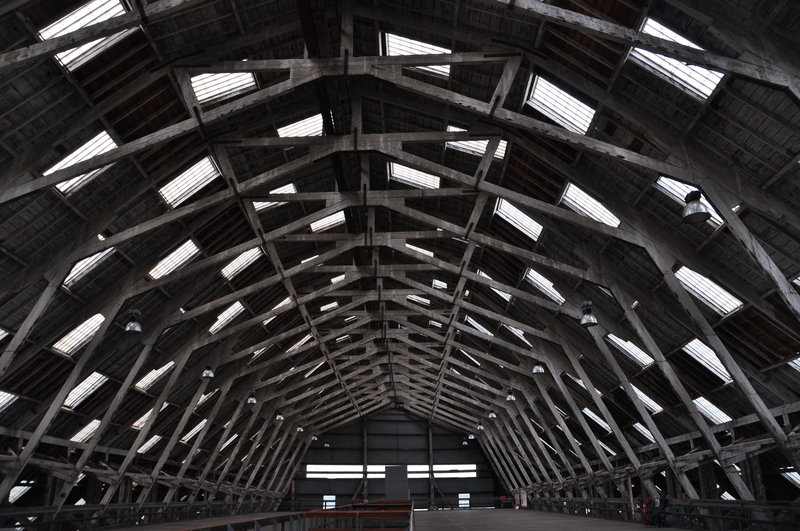 The Historic Dockyard Chatham boasts of being the world’s most complete example of an historic dockyard from the age of sail. 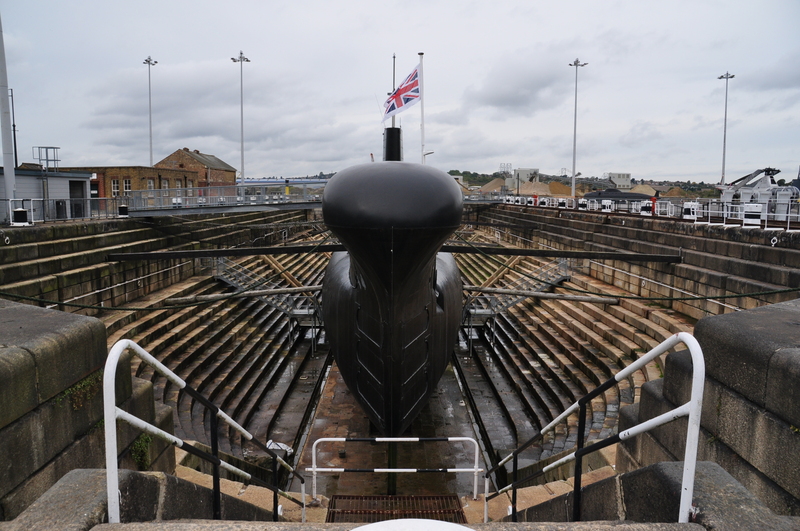 With roots in Tudor times, and parts still in use today there’s certainly lots to see – historic buildings, Royal Navy warships and lots more ship-building heritage – all on a massive 80 acre site. Despite the size and variety of buildings, you won’t get lost or confused. The whole place is thoughtfully laid out – each building has a particular story to tell, made clear by the map and signage. The site is really well designed for families – there’s plenty of places to picnic outside, and you can eat your own lunch in the cafe with the soft play too – if your kids will sit still long enough, that is! And that’s where we started our visit, in the Railway Workshop Picnic and Play. 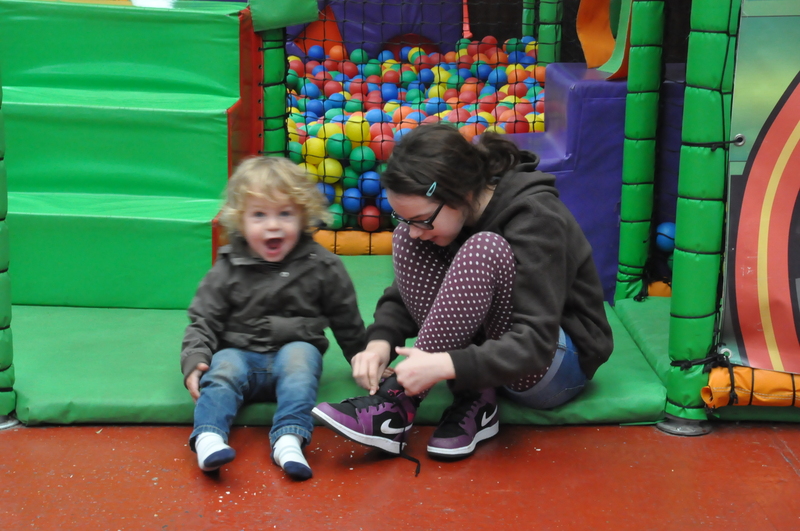 Holler if you love soft play! It’s educational soft play, don’t cha know? As well as a locomotive themed soft play area, there’s the real mccoy to look at, inside and out. You park a car, and moor a boat, but what do you do with a train? Suitable refreshed and legs stretched, we then explored the BIG store. No, it really is MASSIVE – built in 1838 so that ships can be worked on under cover, it was Europe’s largest wide span timber structure. Inside is a collection of green army vehicles from the Royal Engineers Museum, Gillingham – from diggers to mine clearers, with several pontoons, tanks and mine layers too. The toddler was very excited to see them all – and we could (mostly) answer his ‘What’s that?’ questions as each one had a descriptive panel. Although these were aimed at specialists rather than families so sometimes we didn’t quite know what it was, even after reading the blurb! 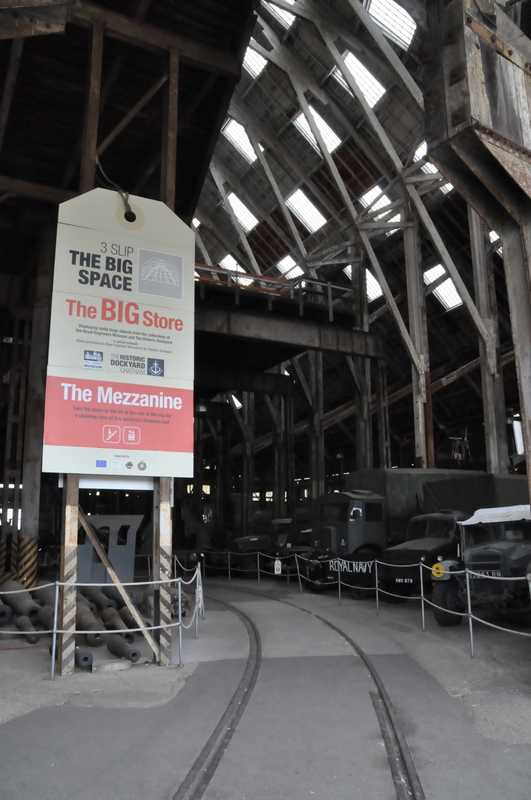 The building itself is stunning – the sheer scale of it, as well as the worn and weathered wood. You can climb up the stairs or take the lift and see the cathedral-like light filled mezzanine level. The toddler and tweenager both enjoyed exploring this space – the tweenager was especially amused by the ‘Boring Machines’ label! However the store is open to the elements, so inside is a bit chilly and houses rather more pigeon poo and spiders webs than I like to see in a museum collection! We then visited the Heart of Oaks – a half hour digital theatre experience in a historic building. A costumed interpreter introduces you, and you wait for the doors to open for your visit to begin. 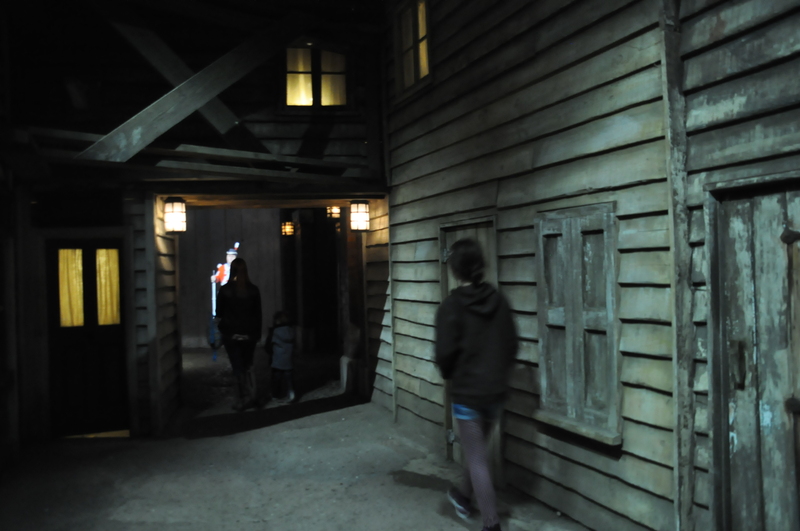 Once the show begins, you take a journey through a re-created set of early 19th century Chatham dockyards. You follow a retired Master Shipwright, John North, as he he takes his (fictional) grandson to the docks to try and persuade him that he wants to become a shipbuilder rather than join the navy. 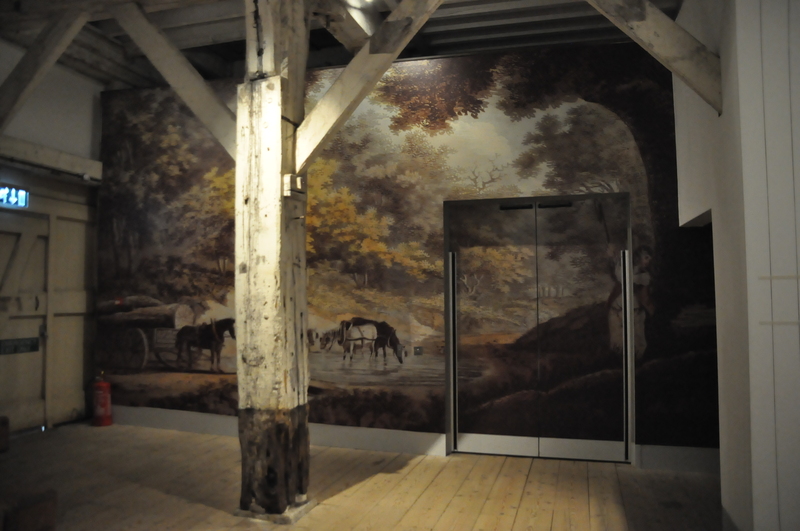 The actors and other images are digitally projected onto walls, floors, and the room dressings too. We all really enjoyed this, even the toddler who I thought might be a bit young for it. It is definitely the best example of digital theatre I’ve seen- the rooms are incredibly atmospheric and I was wowed by the high tech element of it too. 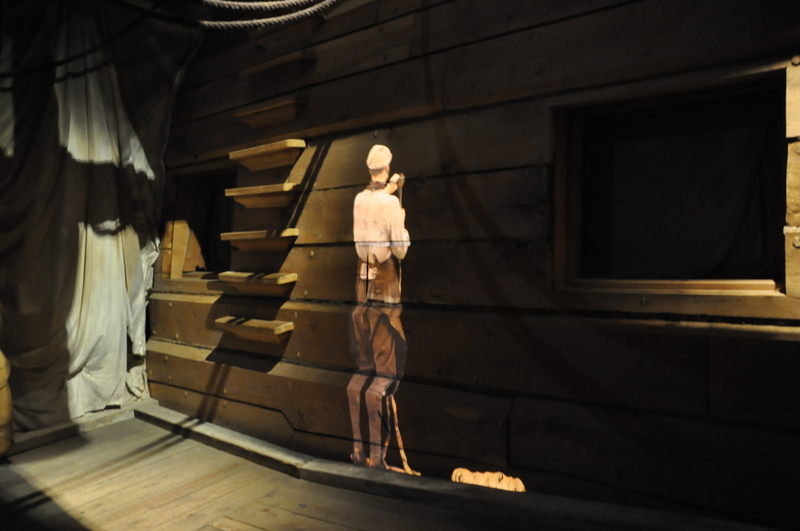 My favourite part was when they drew digitally on the floor, mimicking how ship builders would chalk parts of the boat on the floor to make a pattern piece, before taking it down to the dry dock. It honestly was a lot more impressive than I’ve made it sound. I’ve even made it look rubbish in the photo! You’ll learn a lot about wooden ship building by stealth too – from the types of wood, steam bending and caulking to how ships creaked when settling in. My only grumble would be that it is not timed for those using the (slow) lift – so if you are in a wheelchair or have a buggy you will miss a few parts, especially as the lift will always be in the wrong place due to the one way circulation! If only the lift could automatically return itself! 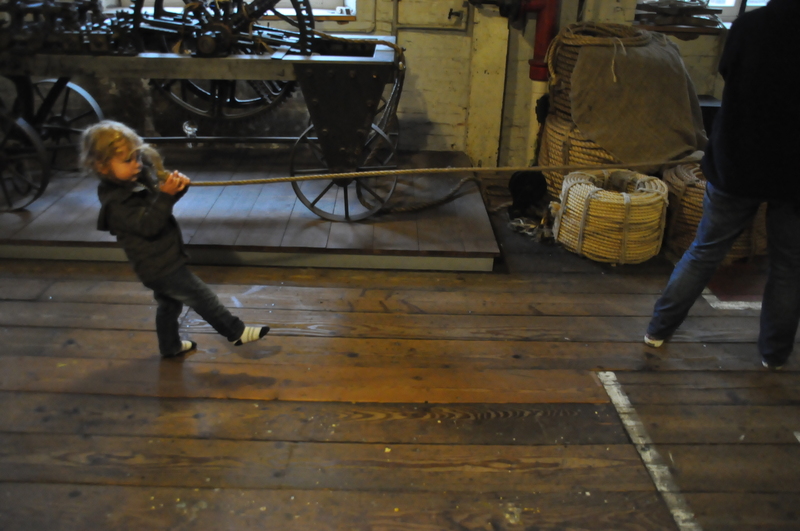 We had timed tickets for the Rope Walk, a 2.5 mile building where rope was, and still is, made. 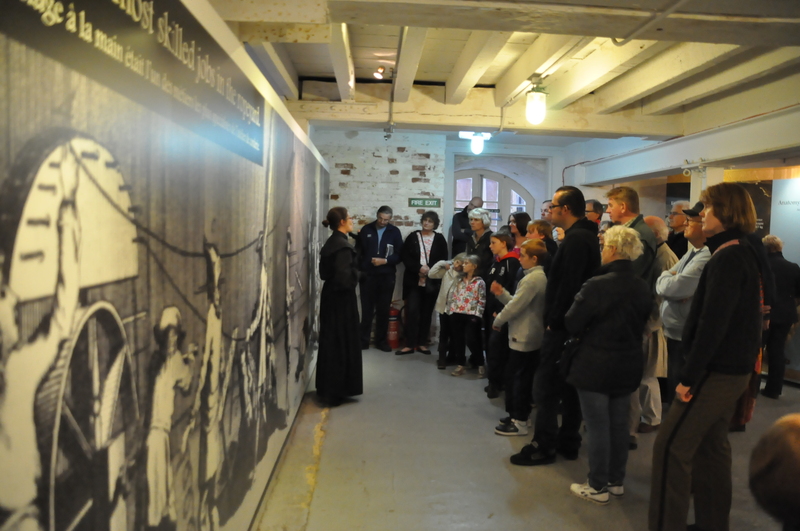 This is a tour by a costumed interpreter, a Victorian widow who tells you why rope was so important to the navy, and after a hands on rope making session, takes you to the rope walk itself. I had to feed the baby so missed the first part but everyone seemed engrossed on my return. The guide was fantastic, and dealt extremely well with my nap-deprived, very excited toddler. He kept shouting out in agreement with everything she said, and jumped up to help with the rope making. She found a way to ‘rope’ him in (sorry!) and even thanked us for bringing him as he’d made the session more lively! I’m not sure the rest of the visitors agreed, but I’m really grateful she made us feel so welcome. We also got a piece of rope we’d made to take away. We had to hurry to our next session – we had timed tickets for Ocelot, a naval submarine and the last ship built at Chatham. The whole family were welcome, but our photographer had to bow out as a baby in a sling and small circular submarine doors do not work together! The guided tour takes you through the torpedo room, bunks, past the tiny kitchen and officers room to see the control room. If the toddler was excited by a bit of rope, he was ESTATIC about being on a submarine. And didn’t he want everyone to know – he kept loudly exclaiming ‘SUB-MARINE!’. The guide took in generally in good humour, although he did try a few gentle fingers on lips shushing, which unfortunately doesn’t work on anyone who’s not been to school yet. The toddler also didn’t really respond to my attempts to whisper quietly in his ear – WHAT’S THAT MUMMY? Despite the familial embarrassment, the tweenager was really inspired by the space and was already planning a return whilst onboard. Unfortunately the darkening sky indicated it was time for us to ‘set sail’, having missed two more warships and the ‘treasure house’ at No 1 Smithery. We’ll definitely be back to see the rest soon – especially as the tickets are valid for a whole year. 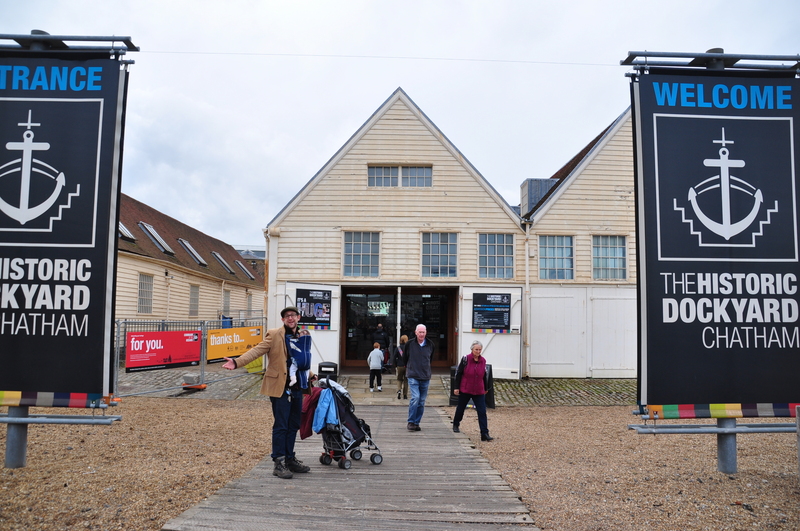 And as Museum Dad wants to walk to the whole of the Ropewalk, and the tweenager wants to revisit the submarine I guess we’ll be redoing a lot. Maybe next time I’ll find out the importance of rope! 2015: TBC, check this page for details. Galleries close from 45 minutes before closing time. Tickets are valid for 12 months from date of issue, excluding the Medway Festival of Steam and Transport and Salute to the ’40s events. See website for further details. Booking: Not required due to size of site. Tours of HM Submarine Ocelot and the Victorian Ropery are by timed ticket. These are free, and issued on a first come, first served basis – ask at reception. Arrive early to avoid disappointment! Buggy accessible? : Yes, almost all of the site is accessible, apart from the warships. Staff will store your buggy for you, or virtual tours are available. Baby changing: There are changing benches in both the mens and ladies toilets in Museum Square, and also in those nearest the outdoor playground. These are a high work surface, with no straps, side bar or mat. Breastfeeding friendly? : Yes, there are plenty of seats dotted around, and there’s even a dedicated room to feed your baby in the toilets nearest the Ropewalk. Toddler time to toilets: Incase you’re in the middle of a submarine, on top of a wooden mezzanine, or quarter of a mile down the rope walk, I’d allow a good 5 minutes. Nearest playground: Indoor soft play and outdoor playground available on site. Want to make more of a day of it? : It really is at least a whole day out in itself. Nearby are Rochester Castle and Diggerland. I used to visit here a lot as a child and you’ve made me want to go back! 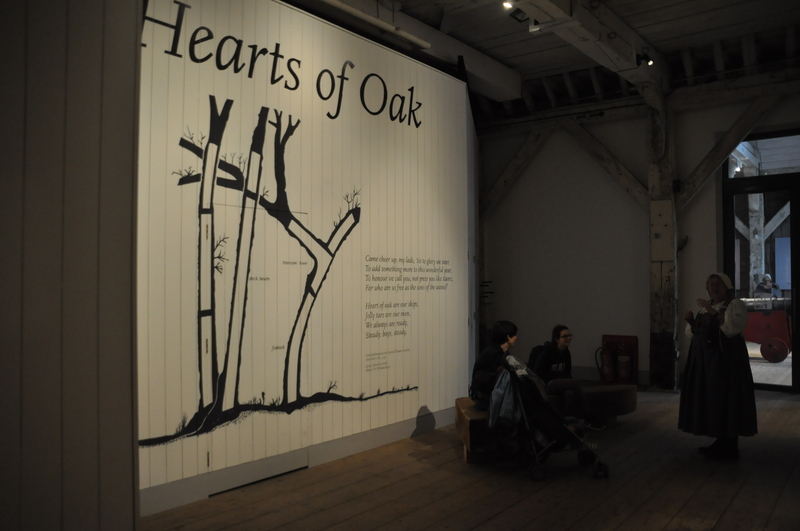 It sounds like the Heart of Oak is the revamped Wooden Walls exhibition which was cutting edge at its time be would be very dated now. Most of my family have worked here as well, either when it was a working Dockyard, or as the historical attraction. Glad you enjoyed it, let me know when you plan a return visit!